Monitor Audio unveils slimline ASB-10 soundbar and WS-1 sub | What Hi-Fi? We liked the Monitor Audio ASB-2 soundbar so much we gave it an Award at the end of 2013. Every time we talked about it, though, at some point the conversation shifted from the great sound it made to the great big size it was. 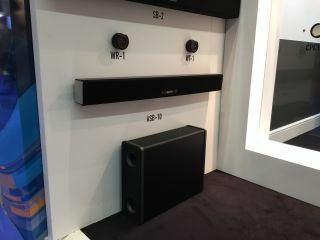 That is not an accusation that can easily be levelled at the company's new ASB-10 soundbar, unveiled today at ISE 2016. It's an altogether trimmer design, yet manages to pack in four class-D amplifiers delivering a total of 100 watts to drive four 7.6cm mid-bass drivers and a pair of 25mm gold dome tweeters. You wouldn't know that, though, because its brushed-aluminium and black-cloth grille is not detachable. Music streaming is provided via aptX Bluetooth, there's optical and coaxial digital inputs and a USB port for firmware updates (Chromecast Audio support is imminent, for example). There's also a wireless link built-in to add connectivity to the WS-1 subwoofer. The WS-1 is an active design, able to be used horizontally or vertically by simply repositioning its feet. It's fitted with 120 watts-worth of Class D amplification, powering a long-throw 8in driver. Both the ASB-10 and the WS-1 are due to go on sale in Q3 of 2016. UK prices have yet to be confirmed, but with €575 for the ASB-10 and €450 confirmed for Europe, one might draw one's own conclusions.